If you have always vacationed at a hotel, it is quite normal to have fears about renting a villa in Cabo. “In fact you are in the majority,” says Rick Wendland, owner of Cabo San Lucas Villas. Rick estimates that only 10% of the people vacationing in Cabo choose to stay in a villa. Let me help you overcome fears about renting by answering some basic questions! Then, you too will be enjoying a new and exciting way to travel. What if I arrive to find the villa doesn’t exist? Although rare this can happen, so it’s important to book your villa from a reputable villa company or website. Try www.cabosanlucasvillas.com, or http://www.loscabosvillas.com. Do your research ahead of time. Find out how many years the rental company has been in business, and look for client testimonials. There is nothing like a review from an unbiased person. Check out the pictures of the villa and google the address for more information. How do I know I will like the villa? Do a little research by surfing the web and viewing pictures and videos of different villas available to rent. Then, contact either the rental company or the homeowner if you are renting a villa by owner. Everyone has a unique vision of what their vacation villa should be and it’s the rental company’s job to make that vision a reality. Primarily by identifying your accommodation, location, and price preferences and matching them to their available inventory options. What, there is no front desk?! Most rental companies have on-site concierge and customer service teams available 24 hours a day. The service you will receive is more personalized than most hotels. Villas can come with staff, and they have a long-standing relationships and intimate knowledge of the home and destination. Some staff can even live on property. One villa I stayed at had a masseuse who is on call 7 days a week! When you book your villa, make sure it comes with the kind of services you require. Everything from spa services to private chef are available. Tell your rental company what kind of services or activities you are interested in. Will I have transportation limitations? Cabo transportation options are plentiful. With everything from taxis to private transportation, you will be able to get around Cabo even if you are staying in a villa. Car rentals are available at the airport and in town. Cabo has the usual rental companies, such as Avis and Budget, for you to choose from. It’s easy to book a private driving services which will take you to and from the airport as well as to any other place you might want to visit in the Cabo area. Victor’s Cabo Transportation or Browns Transportation are both good choices. Aren’t Luxury Villas very expensive? Yes, villas can be very expensive, but they come in all sizes and price ranges. If you are willing to vacation with other couples, a shared villa is an affordable option. 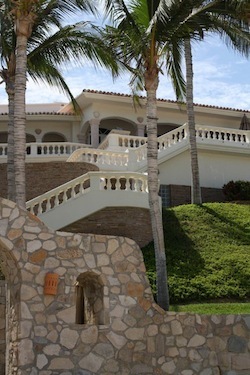 In many cases, renting a Cabo Villa with friends and family can be less expensive than a hotel room. Although renting a Cabo villa may seem scary and out of the ordinary, once you have been spoiled by your own private villa; it will be hard to vacation any other way. How did you overcome villa rental fears? What other villa fears do you have? Laurie Gourley is one of the Partners in All About Mexico. She loves travel!